In 'The Golden Age of Touring', select groups of Travelers expected and received personalized service, balanced itineraries and carefully chosen, well located hotels. Over time, many of these desirable touring principles have long been forgotten - but not by Insight. 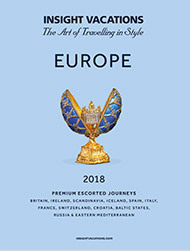 Insight Vacations remains committed to the ideals of the Golden Age and have refined touring to deliver comfort, enjoyment and value, which is why more people choose Insight Tours each year for their European holiday.